A group called Kwara Agenda yesterday staged a peaceful protest to the Government House, Ilorin, alleging a plot to frame Senate President, Dr. Bukola Saraki in a criminal case. The Leader of the group, Taofiq Olateju told Governor Abdulfattah Ahmed the plot was to link Saraki with a murder case involving one Lanre Mohammed Soliu, who was recently paraded by the police in the state over alleged involvement in cult related murders. 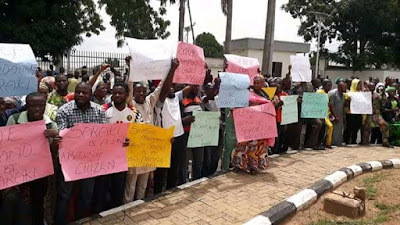 The protestors carried several placards with various inscriptions such as "Fresh plot to frame Saraki uncovered", " stop intimidating Saraki", "we stand with Saraki" among others. Olateju raised the alarm that the suspect was being transported to Abuja while his crime was allegedly committed in Ilorin. "Our attention has been drawn to a fresh plot by the federal government to implicate the President of the Senate, Dr Bukola Saraki in a murder case involving one Lanre Mohammed Soliu. "It is on record that Lanre Mohammed Soliu was recently paraded alongside five others by the Kwara state police commissioner, Aminu Pai Saleh, as members of Aiye confraternity cult group. Soliu was specifically accused of killing one Yemi Bayero of Ago market, Ilorin. The offences which the suspect allegedly committed were carried out in Ilorin, Kwara state, and expectedly he's supposed to be tried in a competent court of jurisdiction in the state. "We are, however, alarmed by a new twist to the whole issue. As we are speaking with you, Soliu is being transported to Abuja by men of Kwara state police command. "This is not our concern, but our concern is about the plot by the powers that be to torture and force the suspect to implicate Dr Bukola Saraki. We have it on good authority that the main purpose of transferring the self- confessed cultist to Abuja is to implicate the Senate President in the whole saga." "As concerned youths of Kwara state, we want to appeal to men of conscience across the country to prevail on the federal government to stop intimidating and humiliating our God - sent leader, the President of the Senate. No Senate President in the history of this country has been so humiliated and vilified as Senator Bukola Saraki, for no just cause." "Saraki is our leader and a law abiding citizen whose passion is to improve the lots of the common man. He should be left alone to continue the good job he and his colleagues are doing at the National Assembly. "We are using this forum to warn those behind this fresh plot to frame and tarnish the image of our leader to retrace their steps. We have no doubt in our mind that this fresh plot like the ones before it shall fail woefully." "Dr Bukola Saraki remains committed to the cause of the Nigerian masses, and their prayers and support shall always keep him going and ensure his victory over his adversaries." In his response, Governor Ahmed promised to deliver the message from the youths to the right quarters as he commended their maturity in carrying out the protest.